A nosebleed is active blood loss from the tissue that lines your nose. It can affect both nostrils, but most often occurs in only one nostril. The nose has many blood vessels in it to help warm and humidify the air you breathe. These vessels lie close to the surface, making them easy to injure. A few nosebleeds stem from large vessels in the back of the nose. These nosebleeds can be dangerous. They may occur after an injury. This type of nosebleed is more common in the elderly and is often due to high blood pressure, atherosclerosis, daily aspirin use, or bleeding disorders. Usually, the older the patient, the more serious the nosebleed. You’ll need to get medical attention if a nosebleed goes on for more than 20 minutes. You should also see a doctor if it occurs after an injury (such as a fall or a punch in the face), especially if you think you may have a broken nose. 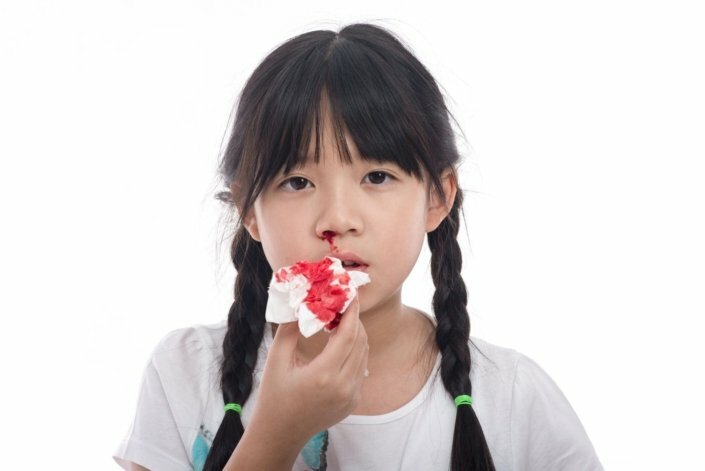 A nosebleed after a fall or car accident could be a sign of internal bleeding. Frequent nosebleeds may mean you have a more serious problem. For example, nosebleeds and bruising can be early signs of leukemia. Nosebleeds can also be a sign of a blood clotting or blood vessel disorder, or a nasal tumor (both cancerous and non-cancerous). Most often, you will have no other symptoms other than the nosebleed itself. The most common causes of nosebleeds are dryness (often caused by indoor heat in the winter) and nose picking. These 2 things work together — nose picking occurs more often when mucus in the nose is dry and crusty. Other, less common, causes include injuries, colds, allergies, or cocaine use. Children may stick small objects up their noses. Older people may have atherosclerosis (which is the hardening of the arteries), infections, high blood pressure, and blood clotting disorders. Nosebleeds may occur if you are taking drugs that interfere with blood clotting, such as aspirin. A rare cause of frequent nosebleeds is a disorder called hereditary hemorrhagic telangiectasia (HHT). Sometimes, the cause of nosebleeds can’t be determined. There is usually no need to formally diagnose a nosebleed. If your nose is bleeding, it is fairly self-evident. Can nosebleeds be prevented or avoided? Counteract the drying effects of indoor heated air by using a humidifier at night in your bedroom. Quit smoking. Smoking dries out your nose and also irritates it. Open your mouth when you sneeze. What should I do when I get a nosebleed? A nosebleed can be scary to get — or see — but try to stay calm. Most nosebleeds look much worse than they really are. Almost all nosebleeds can be treated at home. If you get a nosebleed, sit down and lean slightly forward. Keeping your head above your heart will slow the bleeding. Lean forward so the blood will drain out of your nose instead of down the back of your throat. If you lean back, you may swallow the blood. This can irritate your stomach. Use your thumb and index finger to squeeze together the soft portion of your nose. This area is located between the end of your nose and the hard, bony ridge that forms the bridge of your nose. Keep holding your nose until the bleeding stops. Don’t let go for at least 5 minutes. If it’s still bleeding, hold it again for another 5 to 10 minutes. Once the bleeding stops, don’t do anything that may make it start again, such as bending over or blowing your nose. What will my doctor do for a nosebleed? Your doctor will try to find out where the bleeding is coming from in your nose. He or she will probably ask you some questions and examine your nose. If the bleeding doesn’t stop on its own or when pressure is applied, your doctor may cauterize the bleeding vessel or pack your nose to stop the bleeding. Cauterization involves using a special solution called silver nitrate or an electrical or heating device to burn the vessel so that it stops bleeding. Your doctor will numb your nose before the procedure. Packing the nose involves putting special gauze or an inflatable latex balloon into the nose so that enough pressure is placed on the vessel to make it stop bleeding. Nosebleeds can be a nuisance. They come on suddenly, often with no warning. They can be scary to experience or witness, but they usually aren’t harmful. If you are having frequent nosebleeds, you should see your doctor. I get a lot of nosebleeds. What can I do to stop them? How long should I wait to call the doctor if I’m having a nosebleed? I’m around secondhand smoke a lot. Could that be causing my nosebleeds? Are nosebleeds more common in winter? What can I do to prevent my child from picking his/her nose? Could my nosebleeds be a sign of a separate disease?